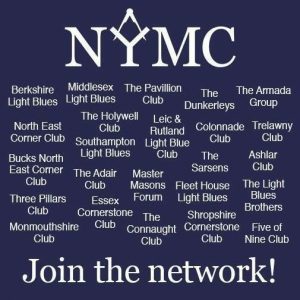 The group was created in 2016 to offer advice on the running and setting-up of a New & Young Masons’ Clubs to existing and yet to be formed clubs, to be a conduit between the NYMCs and UGLE’s Improvement Delivery Group, offer assistance to the Conference hosting club for that year’s event and to promote the benefits of Masonic social clubs to the wider Masonic community. In 2017, the NYMC was honoured to discover that the Pro Grand Master, MW Bro Peter Lowndes, had appointed RW Bro Gareth Jones, Provincial Grand Master for South Wales and Third Grand Principal, as liaison between UGLE and the NYMC. Each year, all clubs in the NYMC group are invited to pitch to host the following year’s Conference. Clubs that would like to host are asked to submit a pitch document outlining their plan for the event, capacity of the proposed venue, a brief history of their club, location and other information they think would make them an attractive option. Once all of the pitch documents have been receiv ed and disseminated to the other clubs in the group, a vote is taken, with each club possessing just one vote. In 2017, three clubs, The Colonnade Club (South Wales), The Essex Cornerstone Club and The Holywell Club of Sussex, threw their Masonic hats in the ring in the hope of hosting the 2018 NYMC Conference. The Colonnade Club (South Wales) were announced as hosts.